In most families, the level of enthusiasm and competence on the slopes varies. Often times, parents are forced to cut-short their time on the mountain to fit around children's needs or ski school times. Stéphane Lerendu, director of Avoriaz tourist office, says, "When it comes to winter sports, perhaps more than for any other type of holiday, one member of the family has to sacrifice themselves for the others." A good family ski resort deals with this scenario and makes sure that everyone has a good holiday, from the expert skiers to the frankly not-at-all skiers. The key is to choose a resort that has the facilities to match your family profile. What suits teenagers will not likely be much use to the very young. As France is still the UK's preferred ski destination, we're bringing you our pick of the best family ski resorts in France. 16,800 beds and not a single car, only horse-drawn carriages. Avoriaz boasts of being the place where you can send the kids to fetch the croissants on their own. Given the car-free environment, right from the start Avoriaz earns big points as one of the best family ski resorts in France. For 32 years the Place central has played host to the ‘Village des enfants'. It is an unusual ski school for teens and youngsters from 3 to 16. Based on the idea of learning through play it has been used as a model in most of the alpine resorts. However the unusual factor is that it also serves as a sheltered spot to entertain the children in a blizzard when the weather is too bad for them to ski. The school is also a childminding centre and a leisure centre where the kids can spend the day and eat their lunch. Lessons are organised so that parents start their own lessons 15 minutes after the children to avoid the stress of trying to be in two places at the same time and give a bit of time to settle the children into their lessons. A real bonus is the new water park, Aquariaz, developed by Center Parks, with all the latest aquatic bells and whistles. 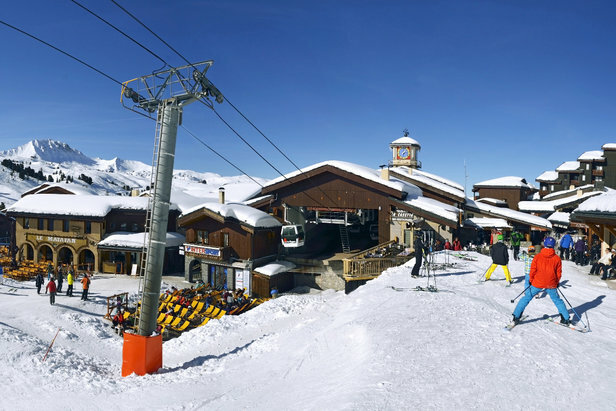 La Plagne is 11 resorts rolled into one with a big spread of mountain terrain for all abilities. It is one of the best family resorts for varying skiing abilities. While advanced skiers explore the extensive, high-altitude slopes of the snowsure paradiski area, beginners and intermediates can practise turns on the many uncrowded blues and greens. Activity highlights include an artificial frozen waterfall to practice ice climbing; the Jean-Luc Crétier ski stadium which is open for night-time skiing; and, for the fearless, France's only bobsleigh run which is open to members of the public (under supervision). 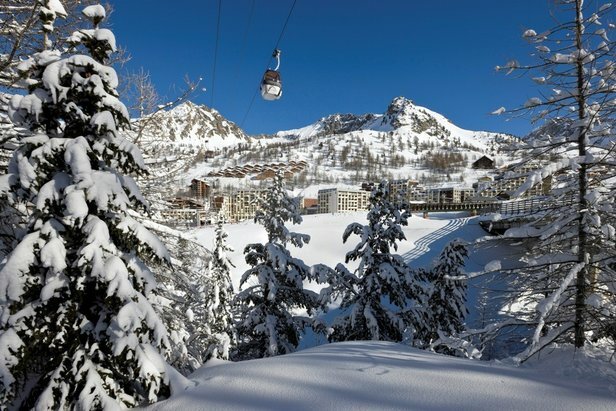 The different resorts are linked by free buses until midnight or by the case Belle Plagne by a cable car. 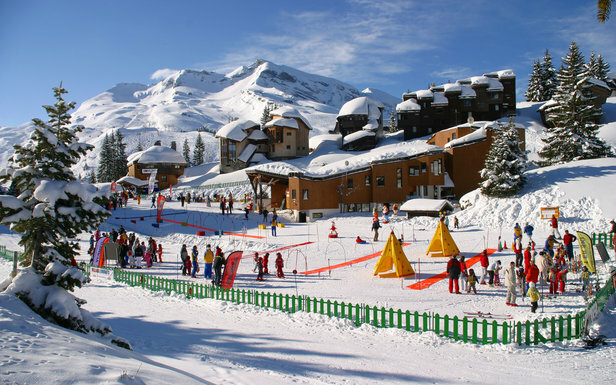 One of the best family ski resorts in France if you have very young children. The resort is car-free and the seven holiday villages are next to the ski lifts. Equipment for children is provided free, including cots, high chairs and baby baths. You can also hire a special sledge for babies and toddlers 'une luge-pousette' for getting around the resort. Children are accepted at the 'halte garderie' child minding centre and clubs without extra charge from the age of 3 months. There are special events for teenagers during the day and a disco every Thursday night . . . without parents. Children can start in ski school at age 4. If you are out on the slopes when your child's lesson comes to an end, a member of the staff will take your child to the ‘jardin des neiges' for you. If you want to stay together as a family, there is a snow play area open to parents and children in the centre of the resort. There are events and activities every night for parents and children throughout the school holidays. 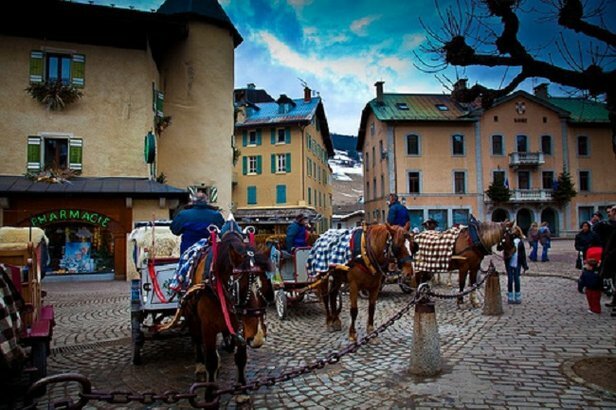 Megève is one of the oldest and most beautiful resorts in the Alps. It has managed to retain its pretty village character, complete with cobbled-stone streets, at the same time as developing a ski resort that is modern and very fashionable. The slopes offer varied runs for beginners and intermediates. It is a resort where ‘l'art de vivre' is at the heart of things, where nothing seems to disturb the calm of the fine wooden chalets and the après-ski is highly developed with some great restaurants. It also has a stunning outdoor ice rink to match. From a family point of view the resort is well known for the high standard of childcare. For better or for worse it has a MacDonalds - with which the French have a love-hate relationship. 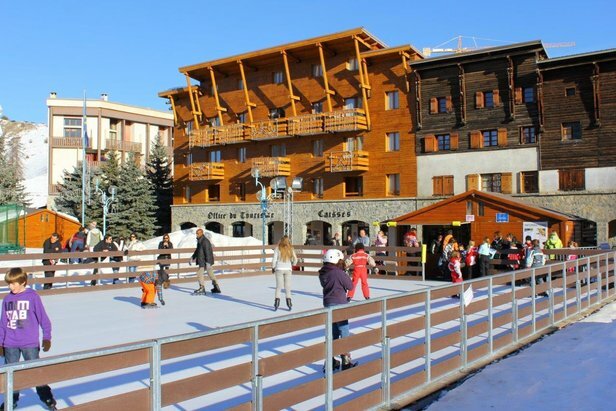 If you want one of the best family ski resorts in France with great dollops of charm, then this is the place for you. This 'best family ski resort' is an alliance of three villages: Chantemerle, Villeneuve la Salle and Monêtier les Bains. Together they make up a huge ski area for all abilities with many tree-lined runs through the forest. On the boundary between the Northern and Southern Alps, it has a micro climate (honestly) with big snowfalls and 300 days of sunshine a year. There all sorts of facilities especially for children including the Club Piou-Piou, a snow garden at Monêtier and childminding facilities. There are a number of easy green slopes for child and adult beginners. The countryside in the Parc des Ecrins is magnificent. The resort is far enough south for the après-ski to have a flavour of the Midi. Isola was built on the frontier in a valley ceded by Italy to France at the end of the war. Because of the high altitude Isola has the best snow conditions in the area. Not everybody loves the architecture but it has a fine and varied ski area with the possibility of alternating snow and beach at the end of the season. Nice and Menton are within two hours' drive. Night skiing is possible twice a week during the French school holidays. There is a Club Piou-Piou for 3-6 year olds as well as a Les Pichtouns for children above 6. This 'best family ski resort' is perhaps better for teens than very small children. For the disabled skier, it is possible to hire a ‘tandem ski' and ski with the rest of the family. Font Romeu in the Pyrenees is a suprerb family ski resort with the largest snowmaking system in the Pyrenees. There is a wide range of activities with the nearby thermal springs, ski touring, snowshoeing, ice climbing, dog sledding, winter canyoning, and telemark skiing. In the village, there is a child-minding service, cinema, casino, bowling alley, squash, tennis, badminton, an ice rink, swimming pool and a gym. Valberg is perched on a plateau surrounded by open alpine grazing and larch forests 1h30 from the Cote d'Azur. The ski lifts start from the main street in the village and there's a small, but popular ice rink. This 'best family ski resort' has a child minding 'halte-garderie' for 14 months to 6 years as well as a special children's area the Parc des Ourson where children start to learn to ski from 3 years old. Despite being so far south, its 308 snow canons cover 85 percent of its ski runs just in case there's a shortage. St Lary, also in the Pyrenees, is known for its big and varied snow fields but also for its superb open-air thermal water centre built in 2005, with saunas, waterfalls and caves. The village is entirely built in stone. The resort boasts 183 snow canons to make sure there is enough snow throughout the season. The ski slopes are designed to suit everyone and features a mogul park and a snowpark with a halfpipe. At St Lary 1700 Pla d'Adet there is an area reserved for families with snow play areas, two toboggan runs and a kids' park recreation area. Off the slopes there is dog sledding, snowshoeing, a disco, cinema, ice rink, a tree park and paragliding.